On 6th August 1939 Colonel Klemens Rudnicki leads his regiment of Polish cavalry, the 9th Lancers, to the town of Jazlowiec in south-eastern Poland. They knock at the gate of the Convent of the Sisters of the Immaculate Conception and ask permission to offer an ex-voto to Our Lady of Jazlowiec. The Sisters, in their blue and white gowns, agree to this request and Sister Lauretta asks that the regiment's heavy machine guns be placed in the watch tower of the old castle. The regiment forms up in the square of the convent and the Mother Superior takes the salute. Colonel Rudnicki asks Our Lady of Jazlowiec for her protection of the regiment in battle. Her image is on their colours. The regiment hands over its ex-voto to the noise of machine guns firing and trumpets sounding! Three weeks later the regiment, at their base in Trembowla, receives the order to mobilise. War is imminent. The cavalry heads west and on 1st September arrives at Nekla, near Poznan. They are told that Nazi Germany has attacked Poland and that they are a part of General Kutrzeba's "Poznan" Army. The 9th Lancers are ordered east to create a line of defence at the river in Dabie. On the 11th they engage in battle with the enemy at Parzeczew and on the 15th they ride through a bombed Kutno. They are in the midst of German forces and faced with the task of getting through them to aid the defence of the Polish capital Warsaw. In the Kampinow forest, near Warsaw, they seem to be trapped. They come under attack from German tanks and planes. Under cover of darkness they ride deep into the forest to escape the Germans. On the 19th of September their Cavalry Group attacks at dawn and a furious battle follows. They regroup and at night strike through Wolk-Weglowa and Mlociny towards Bielany in Warsaw. They reach Warsaw and the lancers are relieved not to have suffered heavily despite their bad situation. They attribute that to Colonel Rudnicki taking the regiment to Jazlowiec before the war. The Calvary group receives new orders to leave Warsaw. On 23rd September they move from the north to the south of Warsaw and on the 24th halt near Lazienki Park. There they are compelled to reinforce the defence of the city. On the 27th September Warsaw surrenders. Two days later the 9th Lancers stand on parade for the last time and are addressed by Colonel Rudnicki. He speaks of the need to continue the struggle, to try to reach France and the faith that the Regiment will soon be reformed. The colours of the regiment are hidden in the vestry of St Anthony's Church in Senatorska Street. On 1st October the regiment become prisoners of war. Colonel Rudnicki and four other officers manage however to escape from German custody. The Colonel returns to Warsaw and later travels to Cracow with the intention of going to France. He decides first of all to try and establish contacts between the emerging Polish underground in Cracow and the Warsaw organisation. Colonel Rowecki is appointed commanding officer of the Polish underground in Warsaw and General Tokarzewski is to be commanding officer in Lwow. Colonel Rudnicki is asked to go to Lwow as second-in-command. He gladly accepts. On 21 February 1940 he leaves Cracow for Lwow. In his attempt to cross the demarcation line between German and Soviet occupied Poland he is captured by Soviet soldiers and put in prison in Przemsyl. He remains there until Palm Sunday when he and other prisoners are taken to the railway station and loaded into a train of cattle trucks. On Easter Sunday they arrive in Dniepropietrovsk, Ukraine, where they are taken off the train and put in an NKVD prison. In May 1940 Colonel Rudnicki is interrogated by the NKVD. He does not admit that he was an officer in the Polish Army. Conditions in his prison cell are bitterly cold during the winter of 1940-41. In June 1941 a senior NKVD officer informs him that he has been sentenced to five years deportation, as a free citizen, in Kirov, for crossing the frontier illegally. Colonel Rudnicki is surprised to receive such a lenient sentence. He is taken to Kirov and told to report to the police station every 10 days and that the police would find him a job. He is given work in a brick-kiln. On 22 June 1941 Nazi Germany attacks the Soviet Union. In August Colonel Rudnicki learns that the Polish government in exile in London and the Soviet government have signed an agreement which provides an "amnesty" for all Poles serving sentences in the Soviet Union. It is also announced that a Polish Army is to be formed in the USSR under the command of General Anders. Colonel Rudnicki decides to reveal who he really is and asks that he be transferred to the Polish Army. In September 1941 he travels by train to Moscow and is taken to meet Beria the head of the Soviet NKVD. After this meeting he goes to the Polish transit centre for officers in Moscow and rejoins the Polish Army. He is given the job of deputy to Colonel Okulicki, the Chief of Staff, by General Anders. The Polish Army is being reformed in Buzuluk on the Volga river and Colonel Rudnicki arrives there on the 1st November. General Anders applied for permission to increase the Polish Army beyond 44,000. The Soviets refused. In December 1942 the Polish Army was ordered to move 1,800 miles to the south to Tashkent in Uzbekistan. In March 1942 an agreement was reached to evacuate surplus Polish Army soldiers to Persia. General Anders decided to evacuate all those who were the most physically debilitated. On 7 July 1942 the Soviet Government advised General Anders that they agreed that the Polish Army could be evacuated from the USSR to the Middle East. The evacuation was to be carried out using trains to transport them to Krasnovodsk and from there ships would take them across the Caspian Sea to Pahlevi in Persia. The last transport was scheduled for mid-September. General Anders had managed to get agreement that the Polish Army families would be allowed to leave as well but other families had to be left behind. Those who were too ill to travel also had to be left in the Soviet Union. Colonel Rudnicki was on the last transport out of Krasnovodsk to Persia. 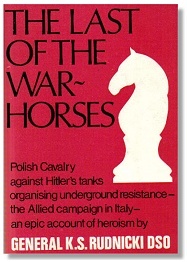 Publisher - Published by Bachman & Turner, London, in 1974. This page was added on 28 November 2009.